Maximilian Kieffer, pictured below by courtesy of Getty images, fired his lowest opening round for five years to take the lead after day one of the Omega European Masters today. 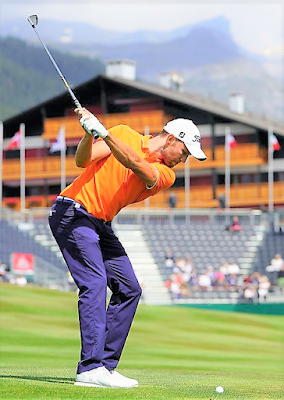 The German birdied three of his last five holes at Crans-sur-Sierre Golf Club on the way to a 64 that left him at six under, a shot clear of Frenchman Julien Guerrier, Dane Søren Kjeldsen, England's Andy Sullivan and Japanese Hideto Tanihara. Scot David Drysdale, Spaniard Nacho Elvira and South African pair Erik van Rooyen and Justin Walters were then two shots off the lead at four under. Kieffer has established himself as one of the most consistent players on the European Tour since graduating from the Challenge Tour in 2012, keeping his card every season since, and recently finished third at the Nordea Masters for his first top ten of the season. Belgian pair Thomas Detry and Thomas Pieters, New Zealander Ryan Fox, Spaniard Pablo Larrazábal, French duo Alexander Levy and Matthieu Pavon, England's Aaron Rai and South African Charl Schwartzel were all at three under. Last week's winner Matt Wallace and local favourite Benjamin Rusch were at two under, a shot ahead of defending champion Matthew Fitzpatrick. Maximilian Kieffer: “I managed to stay out of the trouble today and played nicely. It was a good day, I played very good tee to green and holed a few putts, so I can’t complain. “I played pretty good my first year, I finished just outside the top ten but since then not really. I love the place though, it’s so nice, and it’s a good place to stay calm on the golf course. “I have played very well the last couple of weeks and have been hitting the ball nicely since Sweden and the putting feels ok as well, so just trying to stay calm with the mind and hopefully keep the confidence up. Andy Sullivan: “After three weeks off it feels really good. Got off to a really good start which is always nice and then finished with three good up-and-downs there to finish the round off when I thought like it was just getting away from me. So really pleased with that. “My first nine I seemed to knock it close and hit a few good putts. My second nine I just didn’t quite find the rhythm in the irons really to knock it close, but like I said it was nice to finish it off with those two holes to finish it off. “I think more of the same of what I have been doing. I have been working really hard to getting back to where I was with the shape of the ball flight - it almost went to straight at one time - so I’ve gone back to trying to hit that two, three yard lemonade and it’s coming back slowly and I feel like I’ve got more control throughout the bag again and the scores are starting to show that this year." Julien Guerrier: “It was very good. I started with one bogey on the scorecard and after my game was very good. “It is my second time, the last time I played was in 2007 so they changed a lot, and they are really good. The place is amazing and I really enjoy it." Søren Kjeldsen: “I think last week was a great boost for me to play well the last three days in front of my home crowd, it was really nice, and I think the pleasing part today was that I continued that form. Game was great, obviously had a few problems a couple of times but managed to make good pars but most of it was solid. “It is a tricky golf course. It just takes one second of not paying attention to get into terrible trouble here. I like the golf course, it’s probably in the best condition I’ve ever seen it. I think the greens are better than ever, there seems to be a little less grass on the greens which is really nice. I t is a great test. 70 J Morrison (Eng) , M Baldwin (Eng) , A Connelly (Canada) , B Hebert (Fra) , D Horsey (Eng) , N Bertasio (Ita) , R Bland (Eng) , M Kinhult (Swe) , E Molinari (Ita) , M Foster (Eng) , A Wu (China) , R Fisher (Eng) , J Dantorp (Swe) , A Pavan (Ita) , J Winther (Denmark) , S Hend (Australia) , B Rumford (Australia , K Koivu (Finland) , R Gouveia (Portugal) , W Ormsby (Australia). 73 C Sordet (Fra) , C Hanson (Eng) , S Heisele (Ger) , S Brazel (Australia) , F Aguilar (Chile) , L Jensen (Denmark) , A Dodt (Australia) , L Galliano (Switz) , G Folk (am) (Austria).